Most people don’t think philosophers as natural entrepreneurs. But, Carnegie Mellon University’s Lizzie Silver is proving that isn’t true. In September, UP Pittsburgh hosted a Startup Weekend unlike any of the other dozen it has hosted before. Startup Weekend is a global movement of entrepreneurs who learn the basics of founding and launching successful startup ventures. 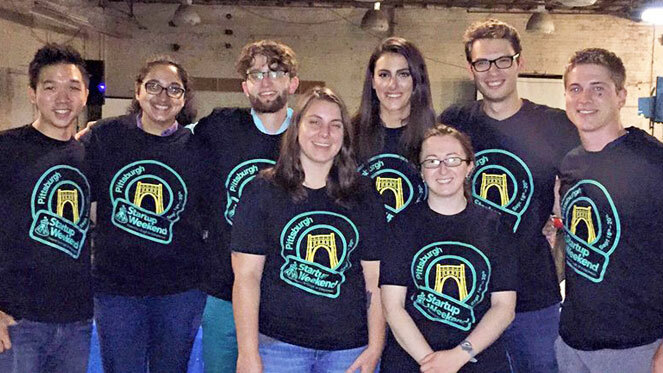 This one was different, though; entrepreneurs at Startup Weekend Civic Pittsburgh (SWCivicPGH) tackled public sector challenges in the city, attempted to solve problems in the community and addressed social issues in neighborhoods. The weekend started with about fifteen ideas from hopeful entrepreneurs, and dwindled to seven that were deemed “feasible” by attendees, which included engaged citizens and Pittsburgh industry leaders. Those seven startups became five by the end of the weekend when it was time to pitch to event judges. One proposal came out on top: involveMINT, a mobile application designed to make volunteering simpler and more effective for individuals, local businesses, and corporations through a streamlined and innovative approach. Lizzie Silver, who received her M.S. in logic, computation and methodology and is currently working on her Ph.D., was a member of the eight-person team that put together the pitch. Dan Little, a CMU Civil Engineering alum, was the leader the group. The premise of involveMINT is that individuals find opportunities using the app in their community, and then receive credits for the hours they spend volunteering. Those credits can then be used in exchange for goods at participating local businesses. Corporations can sponsor community projects by donating funds and are able to validate that community relations spending with the app. Volunteers are also required to take photographs during their hours at events to verify their credits, and then corporations can use those photographs in their marketing and public relations materials. The application interface also allows users to see which of their Facebook friends are volunteering at events, making it a community event. The involveMINT team came together at Startup Weekend Civic organically, Silver and Little said. No one knew each other before that weekend, but they became a family pretty quickly. They worked well together because of a diverse set of backgrounds including developers and business-oriented folks – necessary skills for a team of entrepreneurs.